Early in the blog we were introduced to perovskite, one of the simplest and most common mineral structures. A vast number of crystals are derived from the perovskite structure, which typically contains two different metals (A and B) and a counteranion, such as oxygen (O), in the ratio ABO­3. 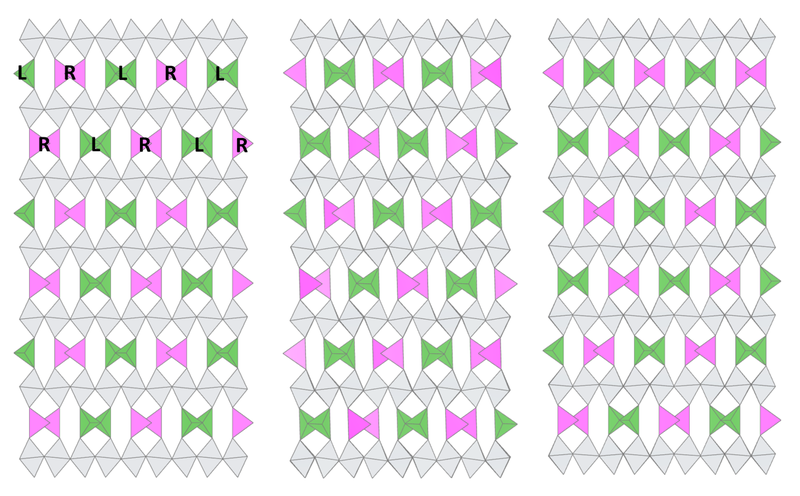 The brownmillerite structure (blogged on March 5) is one such derivative of perovskite, created by removing one-sixth of its oxygen atoms in rows. The B-metal atoms nearest the “missing” oxygens now have only four oxygen neighbours, which form a tetrahedral shape around them; the other B-metals have a full set of six oxygen neighbours, which form an octahedral shape. (Why octahedral? Six corners = eight faces!) Each tetrahedral shape is linked at the corners to two others, making long parallel chains of tetrahedra which extend throughout the crystal in one direction. Removal of the black-boxed O atoms from perovskite (left) produces the brownmillerite structure (right). The tetrahedra, with their two missing oxygen corners, turn out to be a bit too big for the space they’re in, so they twist slightly to make a better fit. Because each tetrahedron is linked in a chain, the whole chain has to twist the same way, either left (L) or right (R). The question is: if the first chain twists to the left, which way will the next chain try to go? The same way (L)? The opposite (R)? Or will it choose an orientation at random, without any reference to its neighbour? In the early 2000s, however, A. Abakumov and coworkers began to notice features in their electron diffraction images that were inconsistent with these three simple models. Subsequent re-investigations using modern high-quality diffraction data revealed a range of more complicated patterns in many known brownmillerites, most of which had previously been contentious or identified as “random”-type structures. Besides creating some interesting problems for crystallographers to solve, the brownmillerite superstructure can actually provide us with information about the physical properties of these useful materials. For example, it was recently shown that oxide-ion conductivity in Sr2Fe2O5 is triggered by the “loosening” of some of its oxygen atoms at temperatures above 600 °C, where thermal energy allows the chains to move and randomise. At lower temperatures, however, a complex ordering pattern is observed among the chains, demonstrating that there isn’t enough energy to allow the oxygen atoms to move around. (Auckett et al. Chemistry of Materials 25 (2013) p.3080-3087) In this way, crystallography might be used to predict which brownmillerites could potentially conduct oxide ions at lower (industrially useful) temperatures. The common brownmillerite superstructures are described by Abakumov et al. in the Journal of Solid State Chemistry 174 (2003) p.319-328, and in other publications.